The deep sands, russets and blues of the Northern Territory are captured and echoed brilliantly in these designs. Prepare to be amazed at their versatility in the projects below. We thank our guest designers Rebecca Cameron, Mel Nunn, Lisa Warner and Jill Geraghty-Groves for bringing these papers to life and providing some amazing inspiration below. Chris's sister is always bugging her to scrapbook her travel photos for her, and now with the BTDT papers Chris has no excuse not to as they are just perfect for this range! 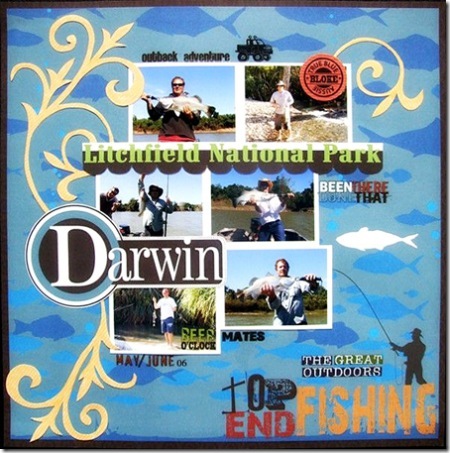 Chris has created a small photo collage of the fishing photos and using the NT Title paper has easily defined on the layout exactly where the photos were taken on the fishing trip. 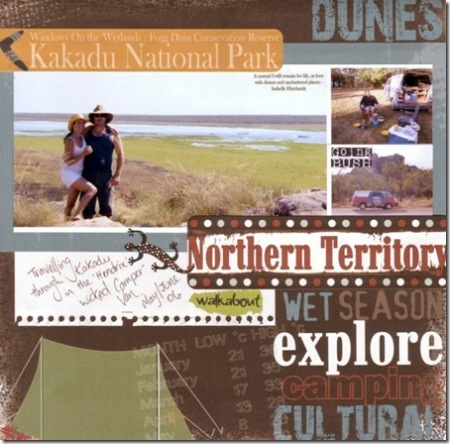 Again here Chris has used the NT range again to put together this layout for her sisters travel album. We love the way that Chris has worked the pictures straight onto the 'Camping Out' papers and has used it as the base of her layout. Using the NT rub-ons Chris has added a few little finishing touches to the page. Cheryl couldn't resist matching these photos with the Northern Territory papers with her sons t-shirt echoing the blues and browns in the striped paper so perfectly. She has handcut the strip of the NT's floral emblem, the Desert Rose and overlapped it over her photos. 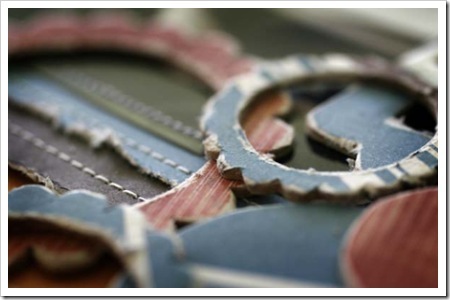 She has grunged up and painted Heidi Swapp chipboard letters for her title. 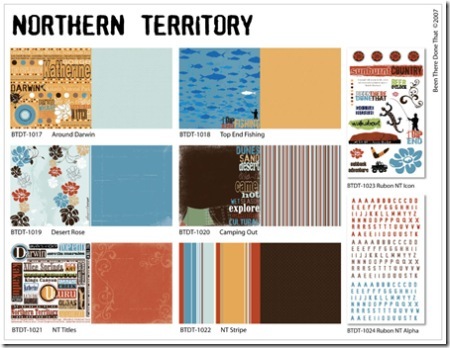 Jill Geraghty-Groves: It is so obvious with these "BDTD" papers that the colours of this NT range have really been caught. I couldn't help myself but to do an "uluru" layout. Very simple, but I think its captured the "feel" of the rock. Jill Geraghty-Groves: I found the NT papers just went so beautifully together! Although they were not traditional "bright" colours, they were strong and contrasted well together. 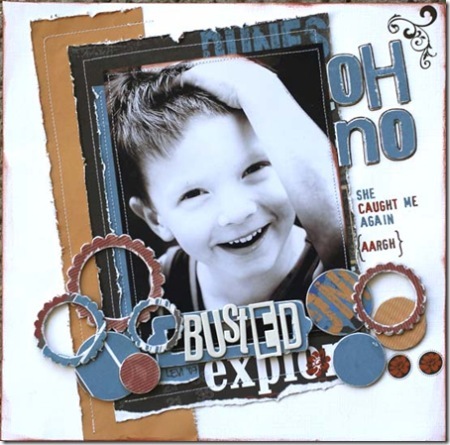 I really though they suited this picture of one of my twin boys when he was caught getting up to mischief! I wanted the layouts to look a little "weathered" so I really got stuck into the distressing and sanding and covered some Li'l Davis chipboard circles, a Basic Grey bookplate and Heidi Swapp alphas to continue the theme. Lisa Warner: As I've never been to the Northern Territory I had no need of place names so i cut them up to make my own words. I painted red in the middle (using a credit card to swipe the paint) leaving the blue of the paper as a border. The brown strips at the edges are sticking plaster. Lisa Warner: I cut the text into random strips and modpodged to the brown paper. Once dry I painted over with green then wiped some of the paint off with a wet rag. The dot pattern on some of the text paper made a good photo corner. Its nice to get this photo scrapbooked, I've had it a long time as you can see by the date! 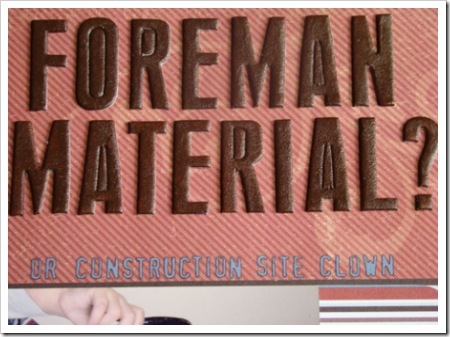 Lisa Warner: I cut up the brown scroll rub-on in order to elongate it and put it in 2 places. I added a tiny red flower rub-on to the centre of the blue flower rub-on. These were taken at the last farm we lived on, in South Australia. Mel Nunn: I found the Northern Territory line of papers and rub ons easy to work with even though I hadn't been to the NT. The papers are double sided and easy to use. May favourite part of my layout? The coordinating rub on flowers that match the paper perfectly, adding another dimension to my layering. 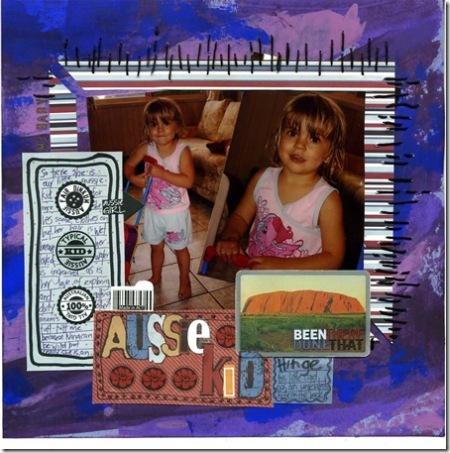 When I received my pack of ‘Been There, Done That’ I have to be honest and say I thought “What am I going to do with these?” I am not a traditional scrapbooker. I don’t use a lot of products on my pages. So, to be sent patterned paper and phrase rub ons was going to be a challenge. Once I got started though the pages just flowed and I didn’t have to add anything to the pages other than paint and pen work. 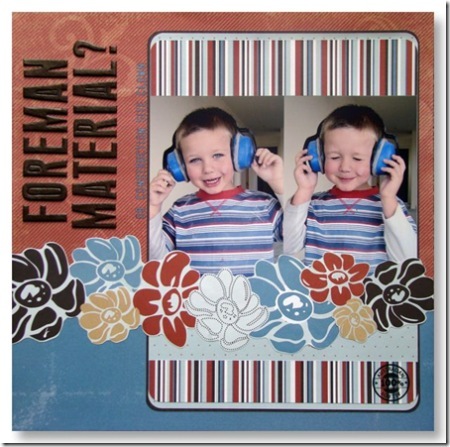 This range can stand alone, no other scrapbooking products are required. 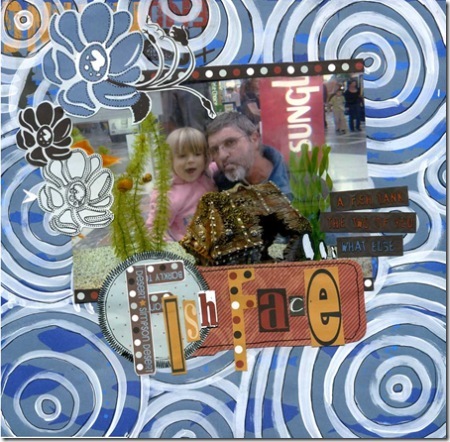 The first layout I completed was ‘Fish Face.’ The ‘Top End Fishing’ paper was perfect for this photo of my father and daughter. I painted concentric circles over the top of the paper and then began layering elements. I cut out the flowers from the ‘desert rose’ paper and used them as a photo corner. To make them stand out more I added some dots and lines. 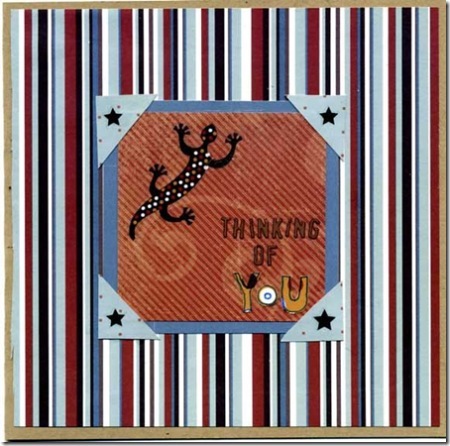 The title was created using letters cut out of the ‘Northern territory titles’ and ‘Around Darwin’ papers. As for the journaling, I used the NT rub-ons. These rub-ons are fabulous. No tearing here. 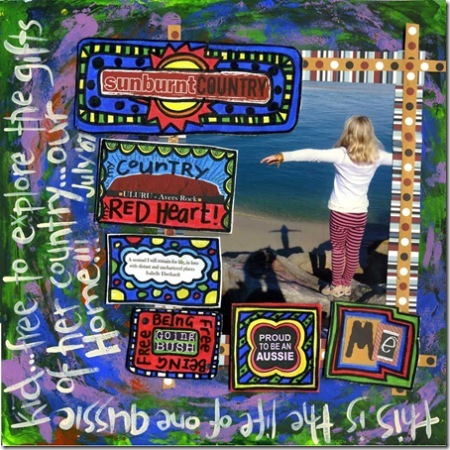 Rebecca Cameron: Next came ‘Aussie Kid.’ Once again I limited myself to use only the products in the range. I did this reasonably well. 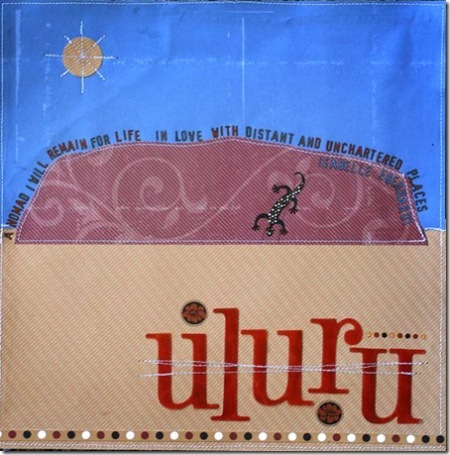 I did end up using a postcard of Uluru. It was just too perfect. The journaling block is my favourite part of the page. I added 3 rub-ons to the ‘Around Darwin’ paper drew concentric rectangles and added the journaling. Quick, easy and really effective. 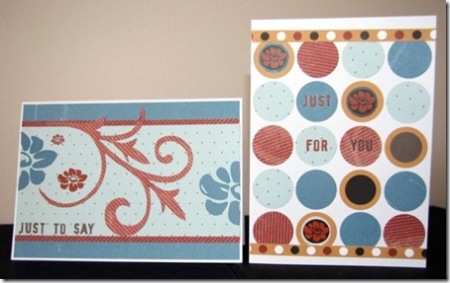 Oops forgot to say, the background card is a hand painted design of my own. 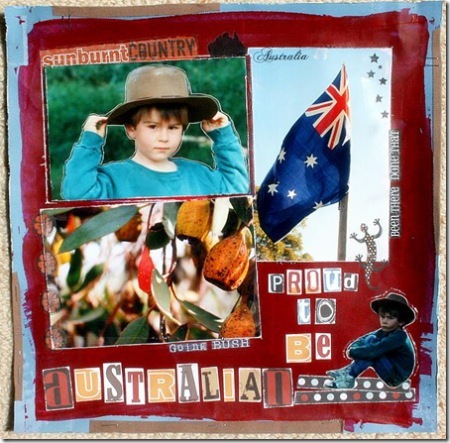 Rebecca Cameron: ‘Sunburnt Country’ has to be my favourite. I painted some chipboard white, allowed it to dry and then added rub-ons. I doodled around the edges and then cut the shapes out. 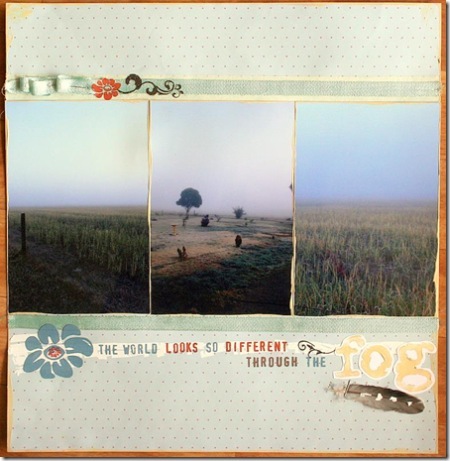 I used the patterned paper to create the border around the photo, added the chipboard embellishments and then painted in the journaling. Again, the background paper is my own painted design. 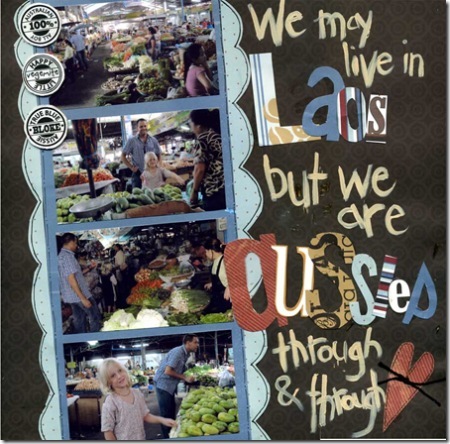 Rebecca Cameron: In ‘Aussies in Laos’ made buttons using chipboard and rub-ons. Letters were either hand-cut or cut from a variety of Northern Territory papers. The borders and heart were also hand drawn and cut. 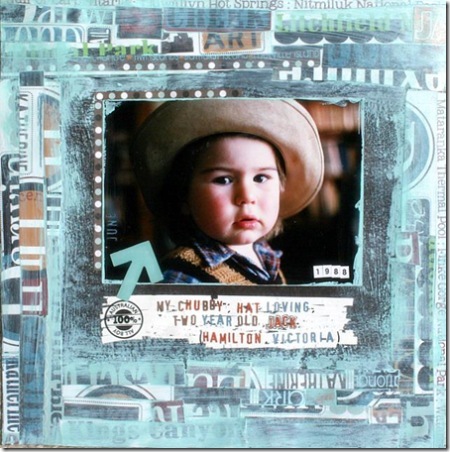 Rebecca Cameron: Finally, I wanted to use my scraps of paper. I decided to make a card. I thought the papers were perfect for a ‘thinking of you’ card. When I think of Australia I think of family. And a few more cards - Chris Millar sees us out of the Northern Territory again using offcuts to make these two very lovely ones.